What Does it Take to Become a CEO? Home » Gold & Blue Magazine » What Does it Take to Become a CEO? “My undergraduate degree got me the job, but it’s the liberal arts that got me the CEO chair,” said Ed Speed (B.B.A. ’70, M.A. ’86), who completed master’s and post-master’s programs in theology. Speed and his wife, Linda, met new St. Mary’s President Thomas Mengler last summer and were impressed with his vision for the University and his belief in the value of a liberal arts education. So they gave $125,000 to the School of Humanities and Social Sciences (HSS) to create the Edward and Linda Speed Endowment for HSS Faculty Development and Research. Soon after, they gave an additional $137,500 to establish the Edward and Linda Speed Peace and Justice Fellows Program, benefiting HSS faculty scholarship that advances Catholic social teaching, human rights, social justice and peace-building. He didn’t forget his business education roots, however. The Speeds also donated $25,000 to The Greehey MBA program. 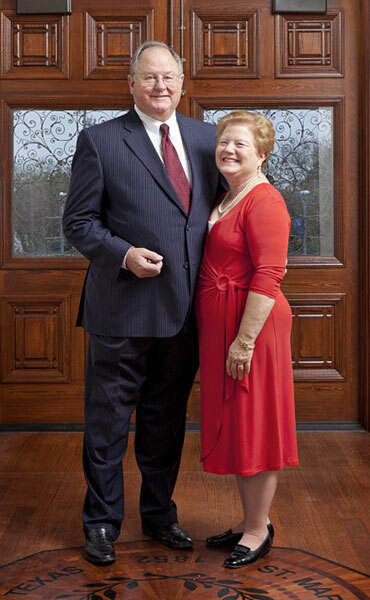 “We wanted to give back to St. Mary’s, but we felt if we could help with faculty development — in philosophy and theology specifically — that would help continue to influence the formation of the whole person,” said Speed, who spent 35 years in financial services, real estate development and construction. Under Speed’s leadership, Texas Dow Employees Credit Union (TDECU), the largest state-chartered credit union in Texas, increased total assets from $700 million to more than $2 billion. He unlocked productivity by probing the minds of his leadership team for their motivations, feelings and concerns. So he’d bring in prominent leadership and personal-skill authors for multi-day management sessions. He even reached into his own pocket to take seven executives to Rome as a teaching opportunity. The Houston Chronicle named TDECU a 2012 “top workplace” among Houston’s large companies because of its strength of leadership, organizational health and employee satisfaction. Speed’s extraordinary business approach featured “disciplined conversation” — a term he learned from The Rev. Bernard Lee, S.M., Th.D., at St. Mary’s. The goal of group discussions was to understand one another, he said, not necessarily to agree. Speed realizes that disciplined conversation starts at the top, which is why the endowments focus on faculty. He envisions professors interacting with their peers at conferences, conducting research and supplementing their education. Speed previously was an adjunct faculty member in the Theology Department, and he’ll return to teach Introduction to Theology in the fall. Speed was awarded the Brother Paul Goelz, S.M. Award in 2003 for his community impact and Marianist values in business. He also helped establish the Houston Business Ethics Forum to encourage Catholic social teaching in commerce.